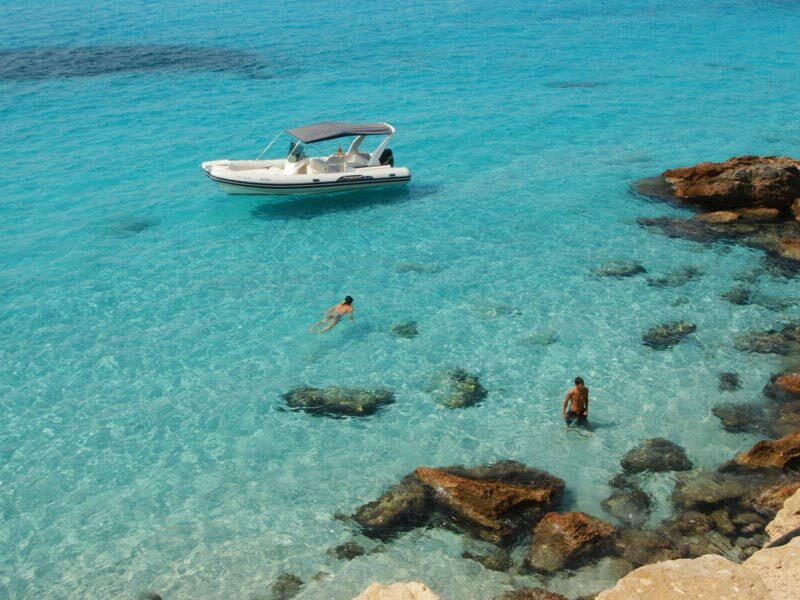 Formentera is considered by many tourists the most beautiful island of the Balearic archipelago and together with the Canary Islands, is certainly, with its coasts, much of the natural treasure of Spain. Without any doubt, the extraordinary beauty of its kilometers of fine white sand and its spectacular hidden coves, offer an absolute tranquility and a deserved relaxation for all those who wish to spend their holidays in Spain in a natural environment, away from tourism mass, during the whole year. The peculiarity of this island is represented by the fact that many of its coasts are free of buildings, thus reflecting the concept of sustainable tourism: all the beaches, in fact, have been awarded the Blue Flag (our Blue Flag), they are accessible by bicycle or scooter, although maintaining the pristine look that sets them apart, they are still equipped with all the necessary facilities for bathing. Let us now set to see what are the most beautiful beaches of Formentera (some of these are considered among the best beaches in Spain), trying to identify their location and their characteristics so you can choose the ones that best suit your needs, should you decide to spend a holiday in this magnificent island. 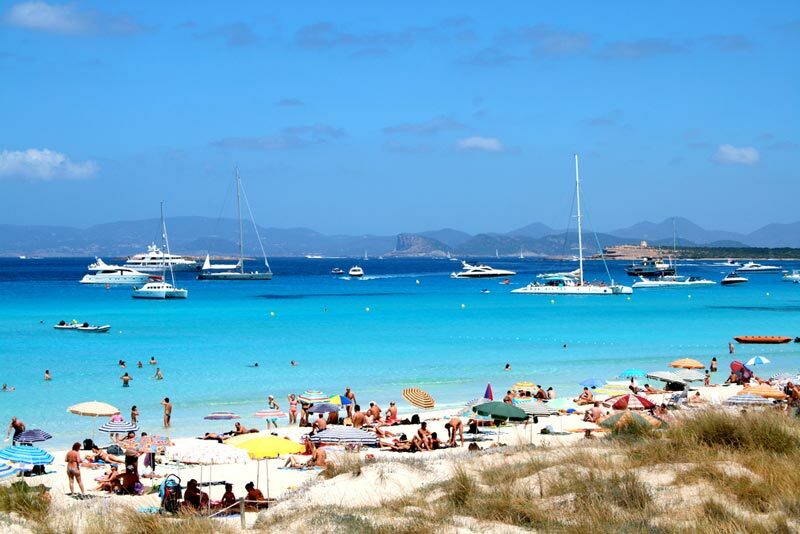 Ses Illetes beach is definitely the most famous beach in Formentera and perhaps one of the most beautiful in the world. It is part of the Natural Park of Saline, is located in Es Trucadors peninsula and can be reached by any means due to Avenida Mediterranea. Almost 1 km long, it is the most Caribbean island beach. With no waves and crystal clear water, it looks very much like a natural swimming pool. Near the beach are a few restaurants, and you can also rent umbrellas and enjoy a myriad of water sports. Located north of the island, is one of Spain’s beaches to visit absolutely. Just 150 meters from the tip of Ses Illetes is the island, uninhabited and wild, Espalmador, divided from the island mother from a strip of sea called Es Pas that, due to the abrupt current, can only and exclusively be crossed by boats that leave from the ports of Illetes and La Savina. The island is a real unspoiled landscape, for this reason was declared a protected park where it is then prohibited any type of construction. 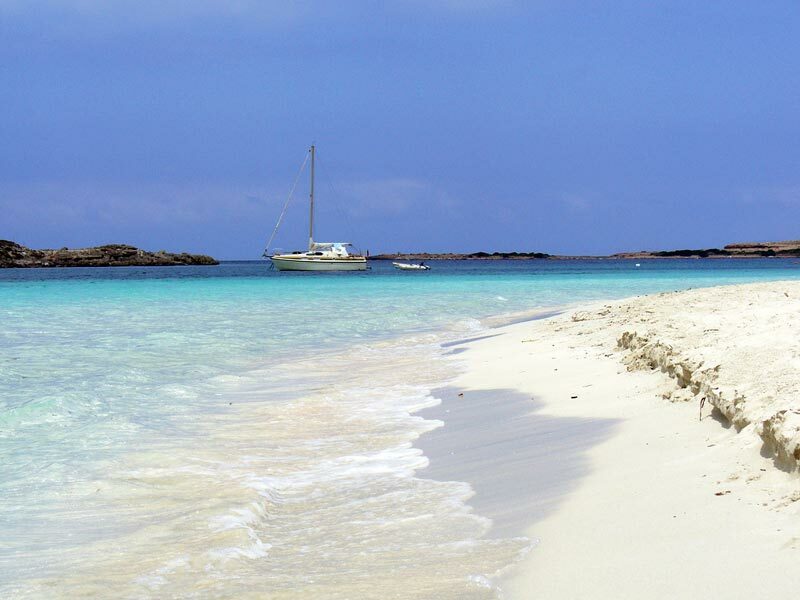 The Racó de s’Alga beach is a natural inlet with fine white sand and sandy bottoms and sloping. Located in the west of the island, because of its special nature, it registers the presence of a considerable flow of nudists. Going up in the east of Es Trucadors peninsula, it is Llevant, a virgin beach with very large dimensions and a disarming beauty. Also known as “Tanga”, for the name of a popular restaurant-bar dislocated at its entrance, it has a very fine white sand with such a clean sea and transparent as not to seem true. Sometimes, because of the wind, they are formed of high waves, but the sea remains always a magnificent color. On the beach there are also kiosks and eateries, but, despite this, the number of tourists is much lower than that of the nearby beaches. Access to the sea is facilitated by special wooden walkways placed in a natural setting formed by large dunes. Es Pujols is the beach that, because of its high traffic, more closely resembles the beaches of Ibiza. The best equipped beach of the island, the same name of the country, is bordered by a pedestrian walkway where you will find bars, shops, restaurants and beach bars. During high season it is visited by many celebrities who love to bask in the sun and enjoy the day out of the “nightlife.” With a large residential area, it appears to be the ideal solution for those who wish to spend their holiday in the place alive and bustling island. 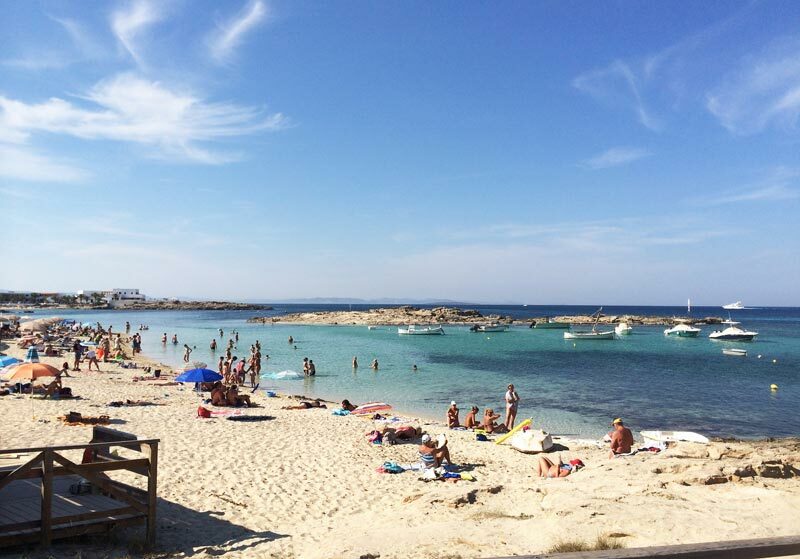 A 5 km long masterpiece … this is the Migjorn beach! It stretches along the island’s southern coast, between Cap de Barbaria and Faro de La Mola, and, because of poor urban settlement in the area, represented by very few houses with direct access to the beach, has only a low crowding. Migjorn, which means “noon” thanks to the name of its characteristic wind from the south, has a lovely coastline full of small coves and golden beaches. Despite his unexpected tranquility, it is equipped with all facilities, including restaurants, beach bars, diving schools and sailing. 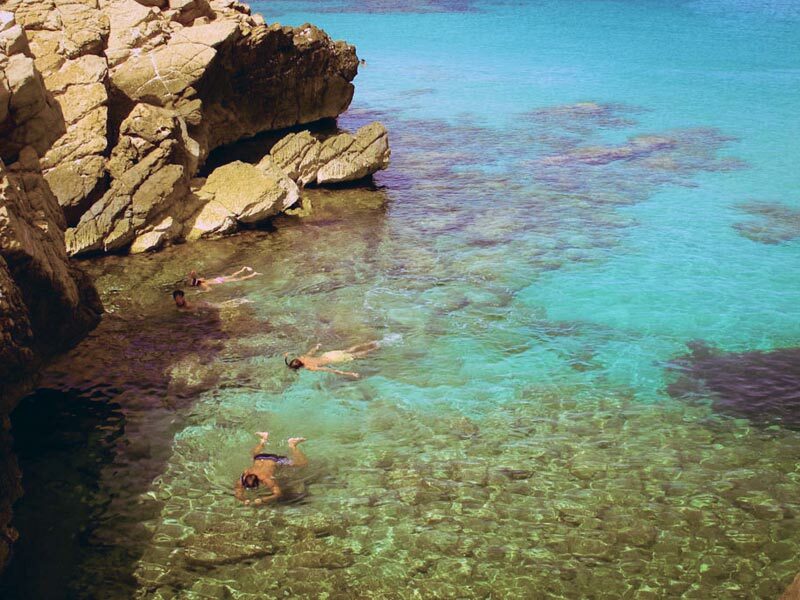 Caló des Morts is a small cove hidden in the southern part of the Migjorn beach, considered a jewel of nature. To get there from the center of Sant Ferran, take the road to La Mola and divert after passing the center of Es Caló. Arrived at the parking lot of the beach, you have to take the path on the left to the chiringuitos of Bartolo; from here you will reach the cove through a staircase carved into the rock. You will find yourself in front of a small strip of sand in a crescent shape that will instantly make you fall in love with the place … Be careful, though, to get there early in the morning because the narrowness of the beach does not allow the water to many people. The busiest beach in absolute south coast of Formentera Es Arenals is to be found further from Migjorn east towards the headland of La Mola. Very reminiscent of some of the beaches of Mallorca for its beautiful natural scenery and, thanks to its wonderful sea and its white beach, it is a very popular destination for tourists. It presents a free, one equipped coast, like most of the Spanish beaches. 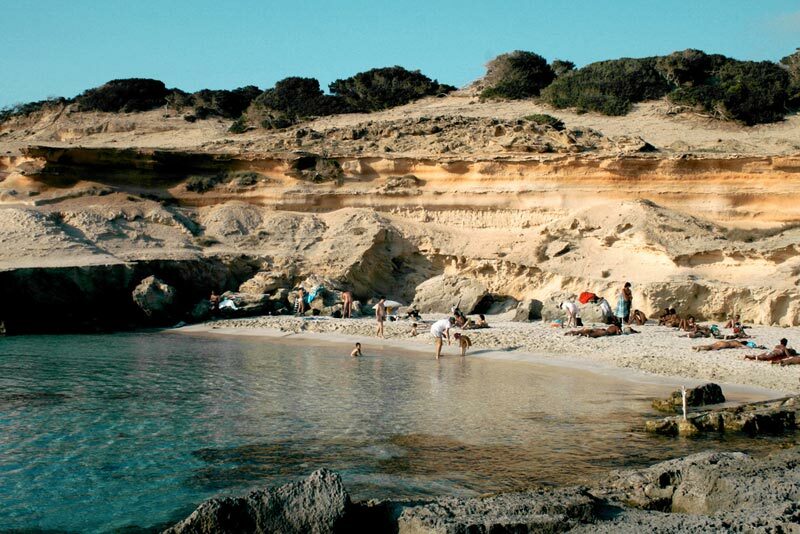 Cala Saona is absolutely the ideal beach for families as it offers all the services, sheltered from the wind and with a very low sandy bottom. Located inside of the Gulf in the western part of the island, it is accessed starting from Sant Francesc Xavier and driven on a straight road and sliding surrounded by beautiful countryside which consists of fig and carob fields. The outer part of the beach is surrounded by a beautiful woody area of maritime pine, ideal for making some great walks. The sunset on the coast is a spectacle not to be missed: the contrast between the red color of the rocks and the deep blue sea, in addition to the background view on the island of Ibiza, is something truly unique in the world. 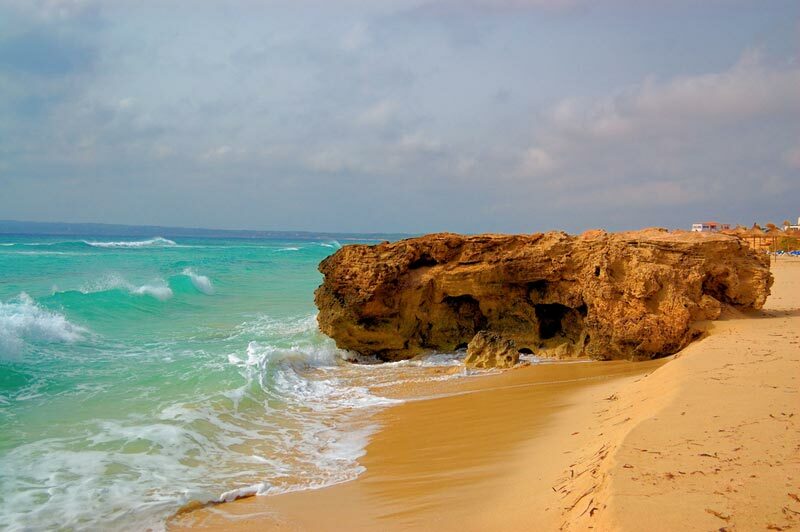 The north-central part of Formentera is certainly not the most bathing island because of the strong winds that blow from the north and rocky coasts that characterize it. At about 300 meters from Es Caló de Sant Agustí we find, however, Ses Platgetes, an unspoiled beach with clear blue sea. Also accessible by bus, thanks to a convenient bus stop located in its vicinity, has a very charming landscape characterized by rich rocky bottoms of many aquatic species such as jellyfish, octopuses and fish of various colors. This peculiarity makes it absolutely one of the most interesting places for tourists who practice diving. Near the port of La Savina is the beach of Es Cavall d’en Borràs. easily reachable on foot from the port, it has a coastline made up of fine sand and a gently sloping sandy bottom, and that much easier bathing. 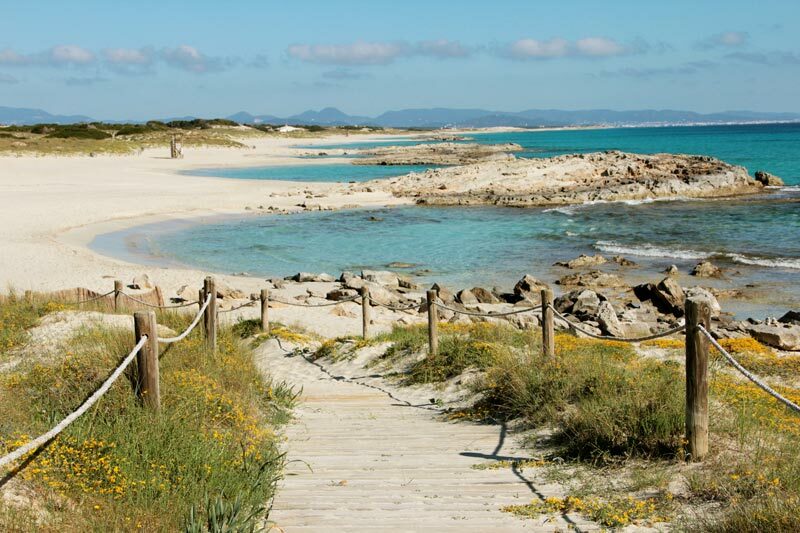 From this stretch of coast, which is part of the natural area of Ses Salines, you can admire the uninhabited rocky islets of Es Vedra and Es Vedranell. The beach of Es Cavall d’en Borràs is known thanks to the presence of two famous beach bars, the Tiburon and Beso Beach, which, each day before sunset, welcome many young people for the famous “Puesta del Sol”, a ritual very widespread in Formentera which is to lie flat on the beach waiting the sun sets, the only sound of the sea to make the background … What could be better in the world? With its beaches full of untouched nature, is the island of Formentera in the Balearic absolute wildest, where the sand and the sea come together in a unique way to create some really spectacular play of colors. If you look in your journey a deep relationship with nature, this island is definitely the place for you! Corfu Beaches, Greece: what are the most beautiful to visit?